It must have been in the monsoons, for I remember that it was raining very heavily. My ancestral village lies somewhere near the Bhutan border and reaching there from Guwahati was quite a journey. Roads weren’t that great, in fact not motor able at any cost. So the 15-20kms inward journey from the highway was quite a journey. I fail to recollect what year it was, but must have been around 2004-2005 as I was prudent enough to recollect this fine young man. There was one patch in the journey which had to be covered on foot because the road was very narrow, amidst the rich paddy fields and thickly muddy. My father led the way, while I walked holding the hands of my mother. As we inched towards our village, a tall handsome young man came running to us from the paddy fields. He greeted my father, helped him with our luggage and walked towards our home. I don’t remember his face, but I remember the smile he had when he tickled me. This was the only distinct memory that I had of this guy, who probably a year later went missing and till date no one has any idea about his existence. Many speculate that he is dead, probably killed in an encounter, for he reportedly joined an insurgent group. This native place I am talking about was apparently notorious for being a hub of many insurgent groups. At a time when insurgency in Assam was probably at its peak, these villages near Bhutan border proved to be the base camps for many such groups. I remember my cousins telling me and showing me spots where a dead body of a kidnapped person was disposed by the militants. Such things were apparently pretty common those days. So when the infamous PC Ram abduction and murder case happened in 2007, it was believed that he was initially kept somewhere near this village I am talking about. Before I start with the next section, at the onset I must clarify that there is no hatred towards the army. This is owing to the situation in the country where even in the name of free speech one cannot raise his/her voice against injustice because there is always a fear of being called a traitor or more politely, anti-national. Going back to this handsome tall boy, the one I wrote about at the start of the narrative. One is not sure what compelled him to join the insurgent group, if he did at all. But after many years, I did deduce something. Back in those days, army raids were pretty common in the villages. I distinctly remember the army camp next to the highway as we started our inward journey into the remote village. As a school kid, there wasn’t much that I made of its existence. But from our brief stays during summer breaks, I recollect listening to elders talking about the army marching in and taking young boys around for interrogation. This was apparently a common routine where men aged 18 and above would occasionally be picked by the men in uniform, taken to the army camp and interrogated. The area that is being talked about here is a very sensitive area. However, it’s a nature’s paradise. I fondly remember viewing the flickering lights from the Bhutan foothills and my elder cousins showing me mystery roads to the mystery land. Those roads led to the origins of many rivers that enrich the plains the Assam, and narratives are to be believed, the scenic beauty is mesmerizing. But what my cousins did not tell me was that these very roads led to the locations where the Royal Bhutanese Army and Indian paramilitary forces cleared up a lot of insurgent camps. Thus, these routine interrogation pickups did make sense from a security point of view as this place I am talking about is a very sensitive zone. People knew things, I agree, villages knew if there was any movement happening. And thus, the army kept their checks on. But what did not make sense for me, which I only discovered later, was the fact that people were scared of the army. They were not scared of the insurgent groups present there, but were sacred of the battalion that was posted to protect the land and the people. There will be raised eyebrows if any learned person reads this, but as a 16 year old I used to listen to the tales of some of my cousins telling me how their friends were picked up by the army in the name of interrogation and were tortured mercilessly. I escaped the whole saga because my parents decided to move out of that place and relocated to Guwahati. But our summer vacation or holiday tours would be full of such stories. On one occasion I remember a few army men visiting my ancestral home. The news reached much before their arrival that they were on their way. We lived in a joint family, and so my uncles advised all my cousins to stay indoors or go out to some safe place. I was a 15 year old kid, studying in an upscale Guwahati school, so I wasn’t really given any particular advice. And thanks to my schooling, my Hindi was prolific. So when the men in uniform arrived, they sat on a bench on the huge courtyard of the house, chatting with my grandfather, I ran up to them, just to speak them in Hindi and salute them. Thanks to the deep penetration of state sponsored Doordarshan, I knew for a fact that you always salute an army personal. So when I went up to them, they spoke to me with a jolly face. At that point, I could not understand why my cousins were so afraid of these men. I don’t wish to elaborate as to what, why and how these interrogations took place. But the handsome tall guy, about whom I started the piece with, was once taken by the army to their camp after which he never returned home. Numerous groups, who made this remote part of Assam their safe haven, visited the villages regularly and from what I heard from the whispers of my cousins, it was not a difficult task for them to win the sympathies of the residents. Rumour has it, that he was persuaded by them to join the group and thus, he went away. Nationalism, army and Kashmir, just enter these keywords and YouTube will bring to you the videos of a primetime anchor shouting at a screen full of panelists. The situation in Kashmir has been the source of TRPs for most news channels for a long time now. 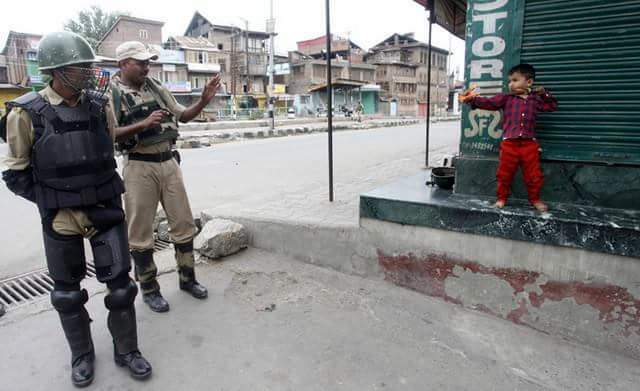 Social media is full of posts either defending the army or supporting the greater cause of Kashmir. Every time I see, hear or read about the army and Kashmir, I always tend to go back to those summer vacation days when I would visit my native place. I always wondered, why can’t our villagers trust the army? Why couldn’t the army win the sympathies of the villagers? And how could these insurgent groups win their trust so easily? The answer might not be that easy, though people take stands very easy. One must understand the fact that it is very easy to influence as well as instigate residents living in such volatile areas. Being from one such place, I understand how one can be lured into activities without him/her thinking of the consequences. The people of Kashmir demands Aazadi, there are few who demands demilitarization of the valley. But is just demilitarization or freedom the solution the entire issue? Trust is an important element that binds a lot of things. If one cannot trust the defence forces, things become very complicated and as such it gives these non state actors to further perpetuate violence and hatred within the masses. Without bringing in much opinion, the whole point of the narration was about how we look at things. How, as a kid, I saw the army and how my cousins saw the army. 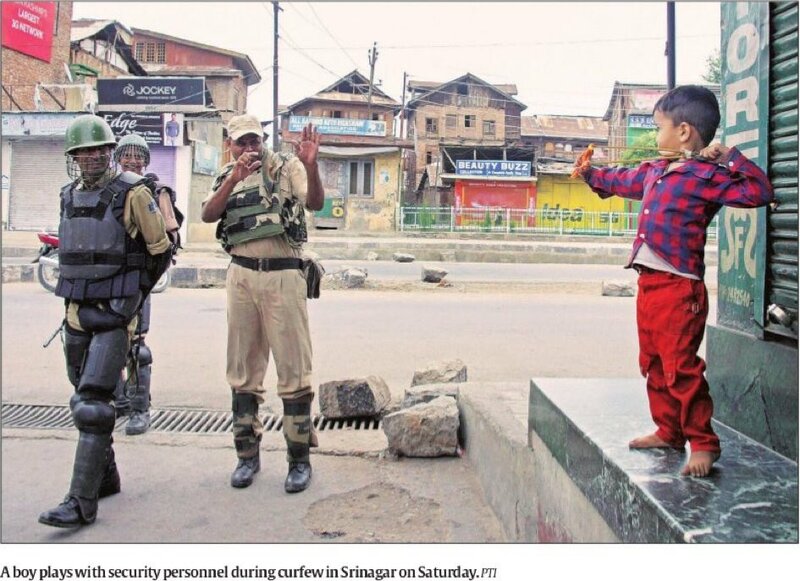 So when this picture of the kid playing with the army in Kashmir went viral, I could not help but write this.